What is Whole Systems Thinking? Campus Planning and Development / Sustainability Office / Whole Systems Plan / What is Whole Systems Thinking? Whole Systems Thinking is a method to understand how things (elements and systems) are related, and how they influence one another within a whole. An example of systems thinking is how elements like water, sun, soil, air, plants, animals and human beings interact and support one another as a system. Systems are a set of interconnected elements that are organized in a way to achieve something. The relationships hold the elements together. For example, a sports team is a system comprised of elements – a coach, players, a field and equipment. Climate is a system, comprised of elements like the atmosphere, ocean, land and ice. What does systems thinking mean? Systems thinking is a method to understand how things (elements and systems) are related, and how they influence one another within a whole. An example of systems thinking is how elements like water, sun, soil, air, plants, animals and human beings interact and support one another as a system. Leverage points are most often (1) points where key choices, decisions, rules, and policies are made, determining system structure; (2) places where information is flowing (or not flowing) and affecting those decisions; or (3) places where one can intervene to break, or make, or change the causal linkages between system elements of any kind. When we understand the components of a system and relationships between them we can begin to understand what affects them, and how to shift them into better patterns. Simple systems sketching and mapping can help us find relationships, patterns, links, feedback loops and leverage points. This often begins with the identification of one indicator (or issue), or a cluster of related indicators, as the starting point for the mapping exercise. This starting point is placed at the center of a piece of paper, on a whiteboard, etc. Then other issues and indicators are slowly added, together with the connections among them. Arrows are drawn from one Indicator to another, to indicate a causal influence relationship. Additional Indicators from the full array are slowly added. The map shows the relationships between various elements related to campus water use, such as growth of the campus, which can increase demand or infrastructure needs. It also brings in economic drivers like agriculture and tourism, which also rely on the ultimate water source/supply – the Okanagan Basin Watershed. The map shows that various inflows to the basin from waterways to snowpack melts create a balancing loop on the supply-side that help to maintain the stock of the basin. In the past, inflows have served a stabilizing role for the basin, creating a balancing feedback loop (water in = water out). However, climate change, demand and many other issues will impact the reliability of this balancing feedback loop. A reinforcing feedback loop exists on the demand-side of the map, where increasing demands for water perpetuate increasing outflows from the basin. Climate change serves to speed the direction of the change by creating longer growing seasons, which will increase water demands for irrigation and completion among users. The campus can help reduce its broader impact on these systems by reducing campus water demand. Key leverage points for change are circled in red. One such leverage point is “campus planning and design”, because at the planning stage we can plan for the development of campus systems, infrastructure and design to reduce potable water use. Xeriscaping, storm water management and low flow fixtures are examples of measures that can be planned for future implementation to reduce campus potable water demand/use. Atkisson, A. (2009). The Sustainability Transformation. How to accelerate positive change in challenging times. Earthscan Publications. Meadows, D.H. (2008). Thinking in Systems: A Primer. White River Junction: Chelsea Green Publishing. 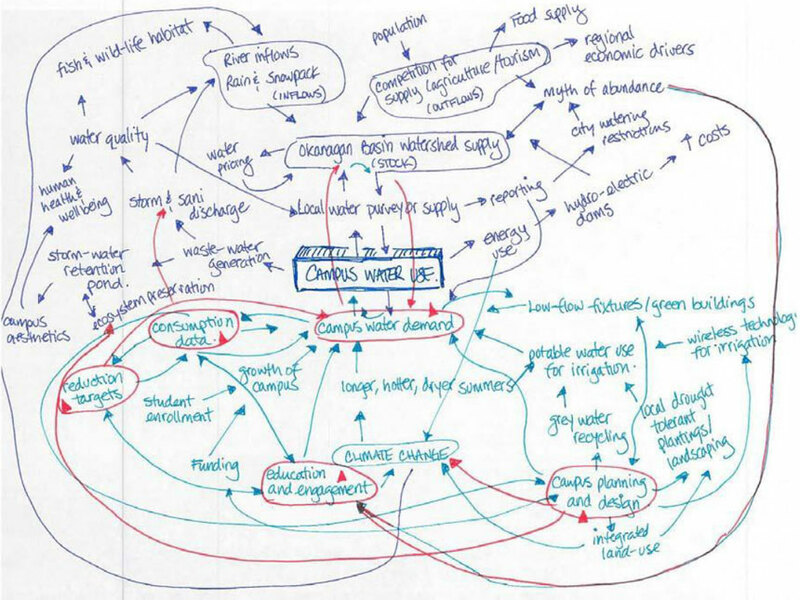 How does Whole Systems Thinking apply to Campus Sustainability Planning? 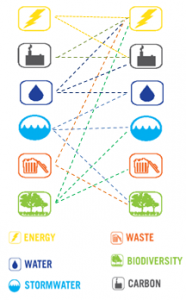 Energy, water, waste, ecology, social and economic systems are intertwined. Campus growth and development at UBC’s Okanagan campus is evaluated through a whole systems thinking lens that considers environmental, economic and social sustainability. Through this process, the campus aspires to move beyond a net zero to a net positive, regenerative contribution, enhancing the wellbeing of the campus community and ecology. enables optimized performance of buildings and infrastructure. fosters interdisciplinary and collaboration among diverse teams to understand how pieces work together as a system, and how to leverage potential synergies between systems. results in optimization of an entire system as a whole, rather than its parts in isolation – a key principle of integrative design. solves many problems at once; creating multiple benefits from single expenditures, and yielding more diverse and widely distributed benefits. An example of the application of whole systems design at the campus is the capture and diversion of waste heat from computer server rooms to the district energy system.